I feel that 2016 beer trends are pushing towards Belgian-style farmhouse saisons and incredibly tart/sour beers that taste more like a wine than a beer, but one trend that doesn’t seem to be dying down is the classic India Pale Ale. One of the biggest complaints I get from local beer drinkers is that too many breweries have their own IPAs and that they’re always too bitter. The trend for overly bitter IPAs is currently on the decline so instead we are seeing more releases of IPAs brewed with one strain of hop to show off the characteristics of what the hop is supposed to smell/taste like in a beer. Alexander Keith’s had a lukewarm “Hop Series” of pale ales that did just that with five single hopped beers. In the end, Keith’s drinkers simply preferred the lack of hop presence of the traditional Keith’s “IPA” so they have, for the most part, abandoned the project. The folks over at Fernie Brewing in Fernie, BC have a “Bucket List” series of IPAs that are mostly experimental IPAs that range from a tropical citrusy IPA to a full on Rye IPA. Their newest (to me) IPA is their “The Eldorado Single Hop IPA”, an IPA brewed with lemongrass. I’m not familiar with the Eldorado strain of hops so I get to try something completely new to me! The Eldorado pours the typical IPA pour, it’s a cloudy orange beer with a nice amount of creamy beige head on top, the head quickly diminishes into just a thin layer of sediment clinging to the side of the glass. The aroma is first, and foremost a lemongrass aroma, it’s fairly moderate and citrusy, grassy, gives off a bit of an herbal… almost tea like essence to it. Hint of pine and grapefruit in there as well. The flavour starts out all tropical, which is great with the heat we’re getting right now, there’s a quench of pineapple and grapefruit that make an appearance right out the gate. The hops aren’t as bitter as your typical cascade “bitter” hopped IPAs, so this one gives off more of a lemongrass summertime patio vibe to it. With all that being said, it does still have that typical IPA bitterness that most of you know and hate, I love it! I’ve had a bunch of beers from Fernie’s IPA Bucket List and I feel that this may be their best beer yet as it’s a nice citrusy, grassy India Pale Ale that’s not overwhelming in any fashion. It’s light to mildly bitter and has a bit of a creamy feel on the palate. This is truly a patio worthy IPA in my opinion! 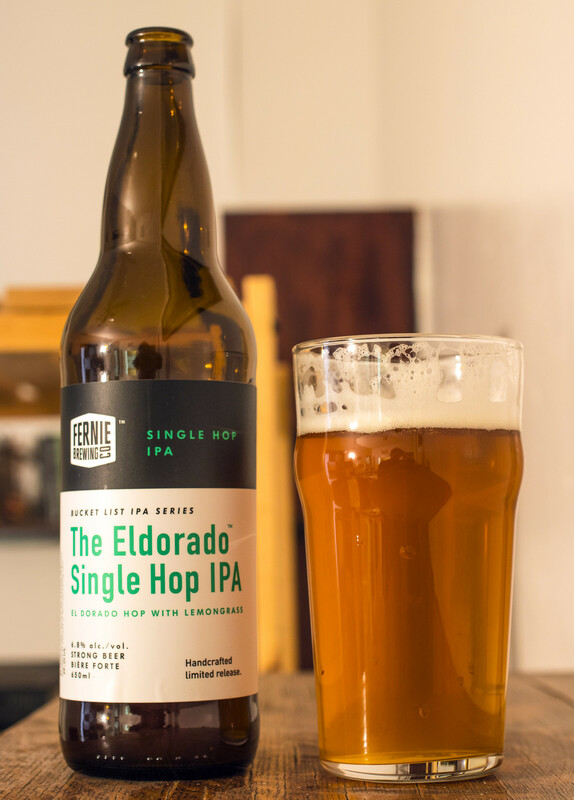 You can find Fernie Brewing’s The Eldorado Single Hop IPA at all three Brandon Liquor Marts for $6.50 per 650mL bottle. Tops out at a surprising 6.8% ABV, certainly stronger alcohol content than your typical 5-5.5% IPAs on the market today. Also remember to like BeerCrank.ca's Facebook page and follow me on Twitter!